Don’t Skimp On Brushes: Make sure you buy high-quality brushes and roller covers. The best paint in the world won’t look good if you try to apply it with cheap equipment. Don’t Paint Over High-gloss Paint: New paint cannot adhere to high-gloss paint, which offers no texture for the new paint to “grip.” Before painting over high-gloss paint, be sure to roughen the texture with sandpaper. Don’t Skip Prep Time: Apply tape, clean walls, remove peeling paint, patch cracks, and let filling compounds dry. Proper preparation is the biggest difference between professional and amateur results. Don’t Skip The Primer: Applying primer is an important first step. It hides minor surface flaws, prevents colors from bleeding through, and gives you a smooth, durable finish. 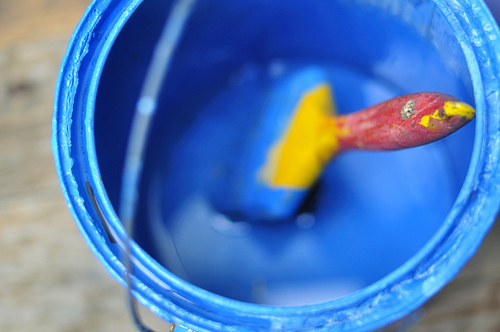 Don’t Soak The Brush: You should only dip 1/3 of your brush into the paint or primer. That way, you don’t waste paint, you avoid drops spattering the floor and your clothing, and you don’t make extra cleanup for yourself. If you decide that you prefer a house painting service to doing it yourself, contact A-1 Kaylor Painting, Anchorage’s most trusted paint contractor. With over four decades of experience, they have the skills and know-how to handle any job. Visit them online, or call (907) 345-7309 to receive a free estimate.